You don’t have to travel to Albuquerque to attend the International Balloon Fiesta (or one of the other amazing balloon festivals around the world) to have a great hot air balloon experience, although I HIGHLY recommend going to Albuquerque! There are fantastic hot air balloon rides that you can do all around the world. I put out the call and asked travel bloggers to tell me about their favorite balloon experience from the far corners of the earth. And oh boy, boy did they come through, check them out! 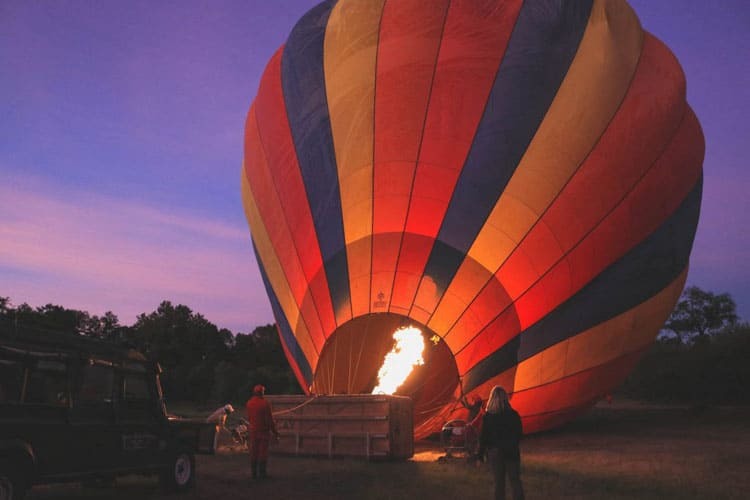 One of the best places in the world to take a hot air balloon ride would have to be over the famous Masai Mara in Kenya. I’ve never been one for waking up before sunrise, but to see the sun rise over one of Africa’s most beautiful landscapes I made an exception. Even though the alarm went off at 4:30 I was all bright-eyed because I knew I would soon be up in a hot air balloon ride. After some coffee and a briefing, we were up and on our way. You barely knew you were off the ground since the ride was so smooth and the only thing you hear id the sound of the pilot throwing more flames into the massive balloon. The special thing about a balloon safari in Africa is that you don’t only get the beautiful landscapes but you also get wildlife. 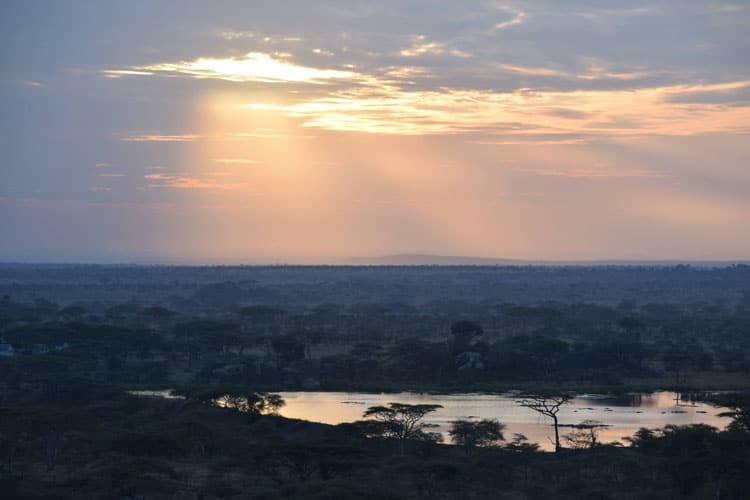 In a silent balloon from the sky, we were able to witness nature’s greatest spectacle without the noisy interruptions that you get in a safari vehicle. I personally was able to see giraffe, hippo, buffalo, and even a serval cat all within one hour on the balloon safari. After we landed I realized the fun wasn’t over as the group sat down to have a bush breakfast in the middle of the savannah. My favourite hot air ride around the world is a sunrise hot air balloon flight over Serengeti national park in Tanzania, Africa. In 1783, France’s Montgolfier brothers first successfully launched a manned hot air balloon flight. Over two hundred years later, here we were at 4am, in the middle of the world famous Serengeti, watching some of the world’s largest hot air balloons being inflated. The powerful flaming bursts of air lit up the dark sky as the blast woke up our ears. Once ready, we slid into our balloon’s basket and buckled up for the ride. As we lifted off and floated high up, it was serene, like a dream. The journey was smooth and so quiet, except for the occasional blast of the burner. We felt very safe. The sky was gradually being lit by gentle orange hues as the sun rose above the horizon. Far below us, we could see animals emerging for the morning, from herds of prancing antelopes to an ominous lone hyena hungry for breakfast. What surprised me was how low we swooped at times, close to the ground. From here we could see so much detail. Passing over a pond, we saw a crocodile lurking in the water and some grumpy hippos awakening for the day. It felt like such a privilege to view the wildlife from this perspective. Our pilot had two decades of experience, so after an hour we descended back to earth with barely a bump. In honour of the Montgolfier brothers’ achievement, we toasted our hosts and each other with French champagne. Our incredible journey concluded with a decadent breakfast under the sun with our fellow passengers. Quite simply, a blissful adventure – and the day had still only just begun. Hot air ballooning over Cappadocia in central Turkey is high on the bucket lists of many, and it’s easy to understand why. The Cappadocian landscape is often described as lunar-esque and even like “Mars,” full of magnificent rock formations that are thanks to volcanic eruptions some 30 million years ago! The eruptions left a layer of compressed volcanic ash known as tuff, and the process of erosion has been doing its thing ever since, creating a terrain like no other. Seeing this unique terrain from above is phenomenal. From going way up high for a 360-degree aerial view to flying way down low through the valleys among the ‘fairy chimnies’ with their mushroom-like caps. As we approached some large rocks, our pilot demonstrated his skills by getting so close that we could basically touch them, and then, at will and with a thorough understanding of flying, he drifted us high above the rock in safety. “Like a Jedi,” he joked. In my opinion, the best reason to go hot air ballooning in Cappadocia isn’t the physical landscape, as awesome as it is. It’s the fact that there are so many balloons flying at the same time. One hundred in fact! Imagine 99 other hot air balloons all around you, dotting the sky with colour. Where else on earth are there scenes like this on a daily basis? There’s the compulsion to document the entire flight with all the varying and breath-taking views presented before you. But do make sure you put down the camera at times and take mental images to pop away in your memory bank. This is an experience you’ll want to remember for the ages. As we lifted into the warm morning air, I could sense the anticipation of the sites we were about take in from a birds eye view. The previous day we had woken up on a Felucca, sailing on the Nile River in Egypt and then explored Karnak Temple in Luxor in the most intense heat. Floating up in the cooler air at dawn was a fantastic way to enjoy the temples. 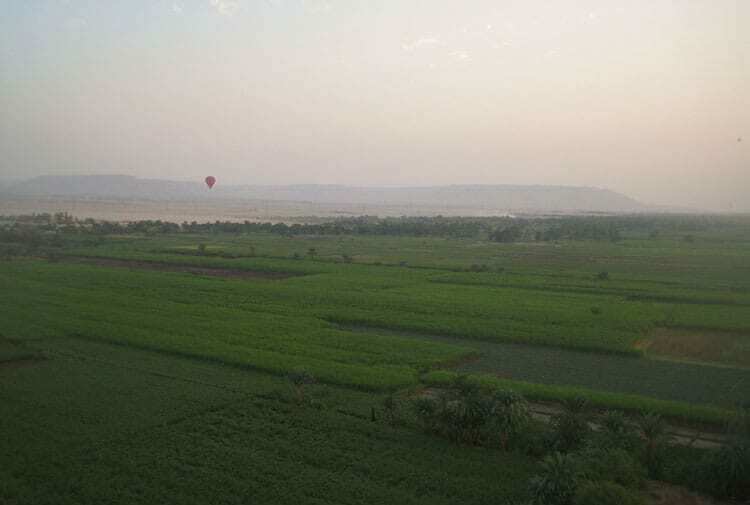 Our hot air balloon ride included a direct fly over of Colossi of Memnon, two huge Egyptian statue figures which are the only remains of the ancient temple of King Amenhotep III. The ruins are located on the Western bank of the Nile River and everywhere we turned there was even more monuments that were historic including the Valley of the Queens. Once we had spotted all the monuments our attention turned to the huge contrast in the fertile land near the Nile River and the barren desert. When you are driving around Luxor, you can see the differences in the land but it is not until you are in the air that the dramatic changes become more evident. We flew low over waving Egyptians waking up to their day in their dirt huts. As we came into land, we were aiming for a ploughed field but instead landed in a tall sugar cane field that was ready to be harvested. As the poor farmers came to survey the damage, I hoped they were compensated by our tourist activity of the morning. 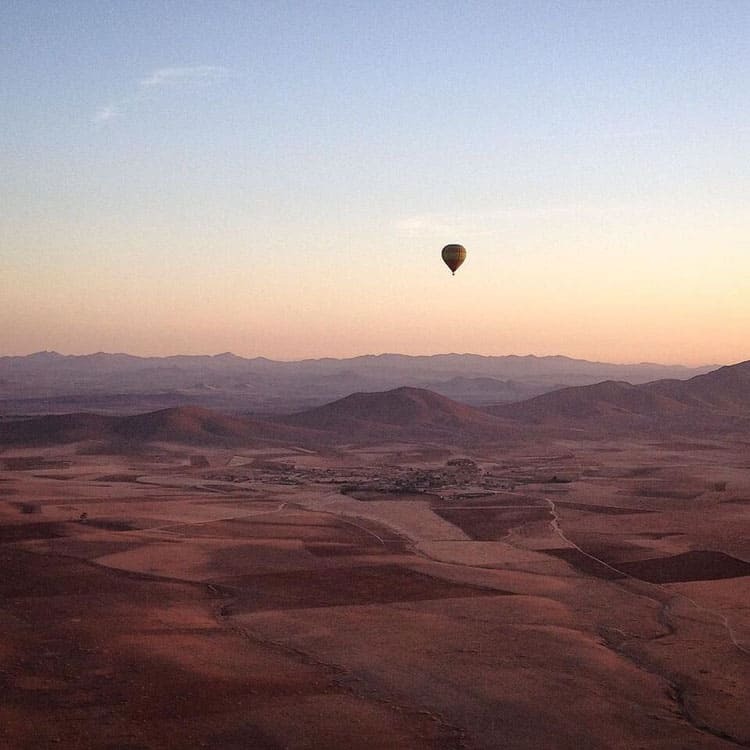 My favorite hot air balloon ride is outside of Marrakech, Morocco. Many people think Morocco is all desert but this is so far from the truth! 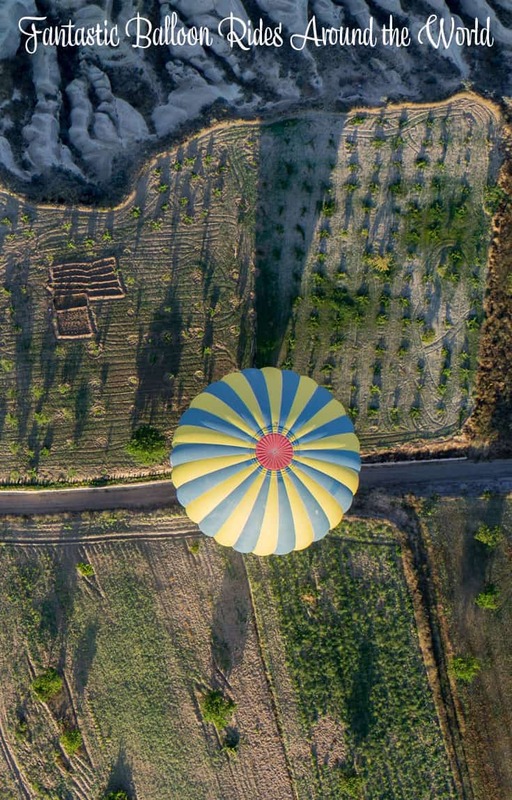 When boarding the early morning balloon flight and setting off the variety of the landscape immediately becomes visible. Craggy mountain peaks, vast open spaces and villages dot the landscape. Due to Marrakech’s extreme temperatures especially in the summer months only very early rides are possible. There also is the possibility that fights need to be cancelled or rescheduled depending on the temperature and weather. Another bonus of taking this ride is that it includes a local breakfast and a camel ride in the palm groves outside Marrakech, for a full Moroccan experience. If I needed to pick my favorite of all the Dubai experiences I lived when I visited the city, that needs to be the hot air balloon ride – or should we say magic carpet ride? – over Dubai’s desert, I got to try a couple of years back. It was unforgettable and an adventure I have been recommending to everyone headed to UAE ever since. Very worth the early wake-up and the hour-long ride to get out of the city and reach the Dubai Desert Conservation Reserve dunes from where they usually take off, as long as you are a tiny bit lucky, you will be able to witness how the sun rises over the horizon. You might even spot one or two indigenous species as oryx or gazelles, from above, as well as lush oasis and endless sea of dunes while smoothly traveling over them. And that is something that, if you are like me, you’ll cherish forever. Vang Vieng is a small tourist town four hours north from Vientiane, the capital of Laos. Vang Vieng used to be famous for drugs and heavy drinking, but the town has tamed down a bit in recent years, making it a suitable destination for all sorts of travellers. Although not as famous as Cabbadocia or Bagan, Vang Vieng is an amazing location for hot air ballooning. The town is surrounded by by beautiful mountains and fields, offering a wonderful backdrop for a balloon trip during the sunrise. The beautiful Nam Song River also flows right past the town. 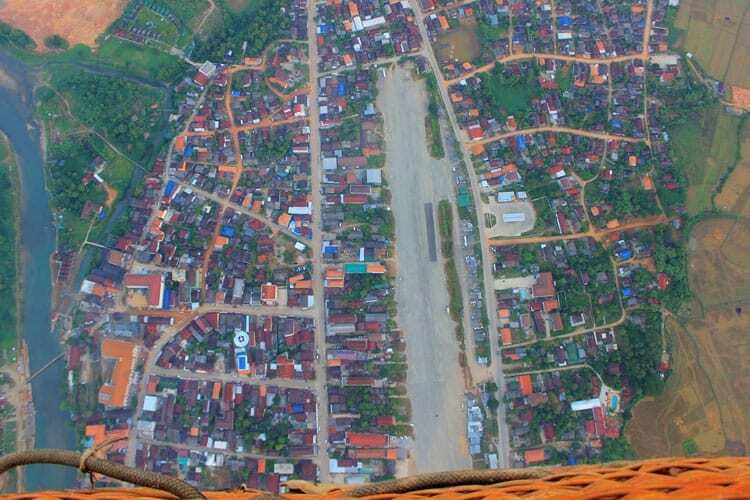 Besides nature, Vang Vieng itself reveals interesting views from above. If the wind is right, you get to fly right over the town, seeing individual people and buildings in great detail. Flying above Vang Vieng is a relaxing experience, and you don’t need to worry about crowds, either – during my ride, there was only one other hot air balloon in the air at the same time. Hot air ballooning in Vang Vieng costs only 90 US$ for a 1-hour ride. This makes it one of the cheaper places for balloon rides in Southeast Asia – and the flight is definitely worth it! There is only one way to get a sense of the enormity of the approximately 2500 structures from the 11th and 12th century lining the wheat colored fields of Bagan. This ancient city is in sharp contrast to the glistening gold of the Yangon temples. Dry grasses and natural brick temples in various states of decay stretch for as far as the eye can see. Families built their own holy places during this time period as a symbol of wealth and power. Today, residents of the area still rely on oxcart for transportation among the unpaved roads running throughout the temples. It is a simple way of life best viewed from above in a hot air balloon at sunrise. The magic begins as you watch your balloon start to inflate in the darkness of early morning. A giant blowtorch sends columns of hot air shooting into the balloon. 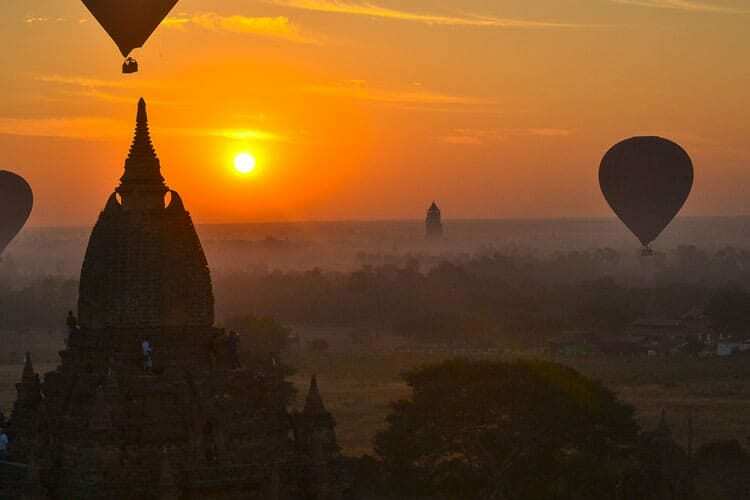 Climb into the vessel and rise above the stupas lining the plains. An early morning fog covers the vista adding to the mystery. Silently floating past the myriad of shrines as the sun breaks the horizon, the only sound is the occasional whoosh of the burners firing additional hot air to rise even higher. Up, up and away. For a short period of time you are transported to a different era, the Irrawaddy River providing a background for this unforgettable sight. Sigiriya rock is one of the most impressive tourist sites of Sri Lanka. It is an ancient rock fortress that was built on the top of a giant rock in 200 CE. This massive column of rock is about 200 meters high. A beautiful palace was built on the top of the rock and the sides of the palace were decorated with frescoes. 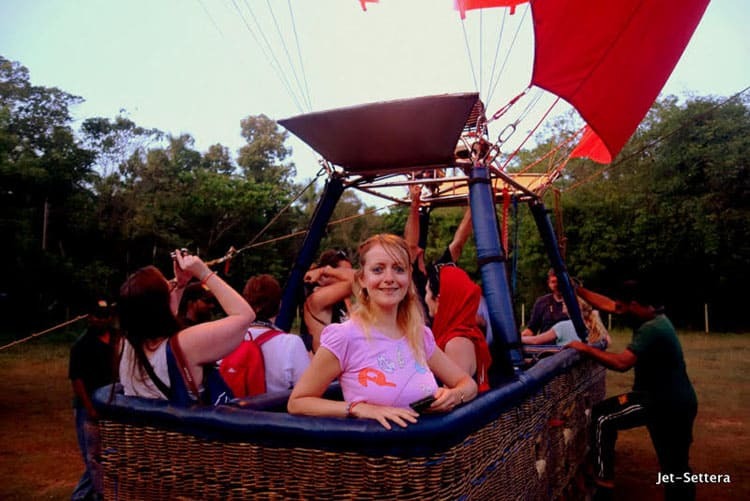 The best way to see the landscape of Sri Lanka and the remains of the palace is by hopping into a hot-air ballon early in the morning and watching the sun rise behind the Sigiriya rock and admiring the beautiful landscapes of Sri Lanka from above. It is very exciting feeling, when the basket takes off from the ground and you are suddenly flying high. It is one of the most exciting adventures you can experience in Sri Lanka. 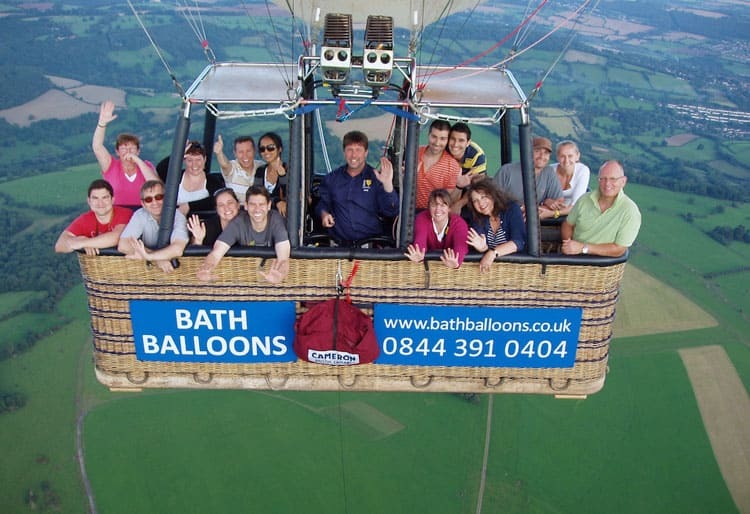 In 2012, Seb turned the big 3-0 and as a surprise, I arranged to take on a hot air balloon ride in the very pretty city of Bath. Bath is found amongst the rolling countryside of southwest England, famous for its natural hot springs and extremely charming 18th-century Georgian architecture. As such it’s a very picturesque place to discover, both on the ground and of course to marvel at from up above. Sadly, as with the rest of the UK, it also has the awful grey, unpredictable weather most of the year! I planned Seby’s surprise in August, thinking this would be the ideal time of year to coincide with the elusive British summer. Hot air balloon rides are of course very weather dependent – if there’s too much wind, it has to be cancelled for safety reasons. Luckily hot air balloon companies allow you to postpone your place if this happens, so you can try again. This happened to us as the first time, the winds were too strong and it had to be cancelled, which completely killed the surprise element of my present. It didn’t matter of course. We returned a week later on a clear, sunny Saturday evening for attempt #2. We met our group of 15 plus the Captain at Alexandra Park. First, we all helped to set up the basket by attaching it to the balloon, then wait for the hot air to be fired into the balloon to slowly raise it up in the air. We all boarded, ropes released and we were off. It was absolutely incredible. The views were gorgeous and most importantly of all, birthday boy Seb loved it. Although the surprise element of this present was ruined, Seb nonetheless had a very special memory, which we will never forget. Hot air ballooning is one of the most surreal and heavenly experiences anyone could have. The world lies below you; the sun warms your face, and your glide peacefully across the sky. A hot air balloon ride across Miami’s Homestead and Redland area adds to the serenity. As you lift off into the air, the Redland opens up beneath you, and in the distance, the farms break up, and the Everglades stretches for miles ahead. 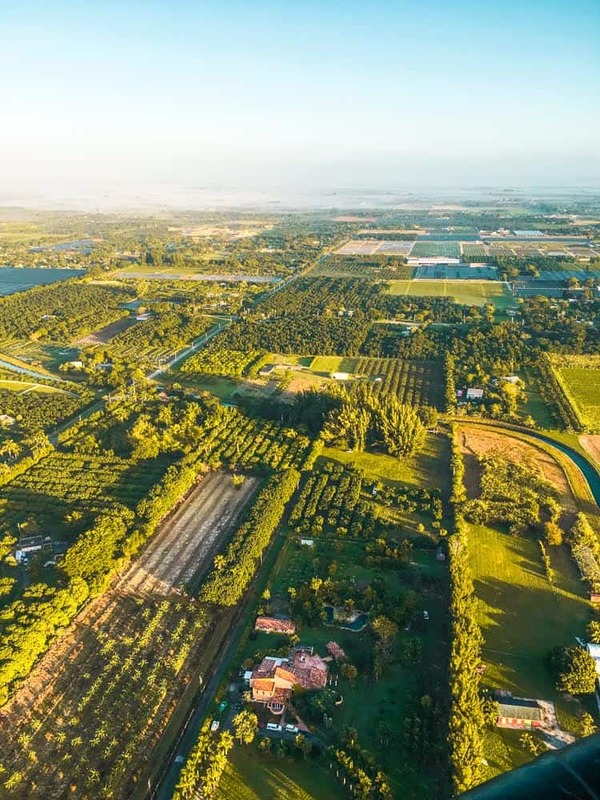 Underneath the basket is the homes of South Floridians, who have lived in the Redland for generations, working their berry farms where you can pick berries after your flight. You may even drift above the historic homes and village. The Redland area also boasts beautiful orchid gardens. Before making your descent back to the ground, you sail beneath the clouds closer to the Everglades, and the early morning mist swirls around it. Don’t worry though; you don’t land in the gator infested marshlands. A kind local farmer lets you descend in his field, and afterward, you enjoy some champagne and cheese plate snacks. From here, you are at the doorstep of the Everglades, one of the world’s most unique ecosystems. As hot air balloons in South Florida leap up into the sky pretty early, you have the rest of the morning and day to explore the Everglades and the rest of South Florida. Twenty miles from downtown Miami, this adventure, close to the heavens, is well worth it. Letchworth State Park in Upstate New York has been dubbed the Grand Canyon of the east due to the epic gorge that runs through its center. Not only has it been labelled the most beautiful state park in the United States. But it also holds the prize as the only state park in America that has a launch point for hot air balloons! The flights last between 45 and 60 minutes and average 2,000 ft. in altitude. And guests even have the opportunity to help inflate and deflate the balloons! Balloons over Letchworth have been operating in Letchworth State Park for over 25 years. And with epic views of the upper, lower and middle waterfalls of Letchworth, it’s easy to see why it’s been so successful. 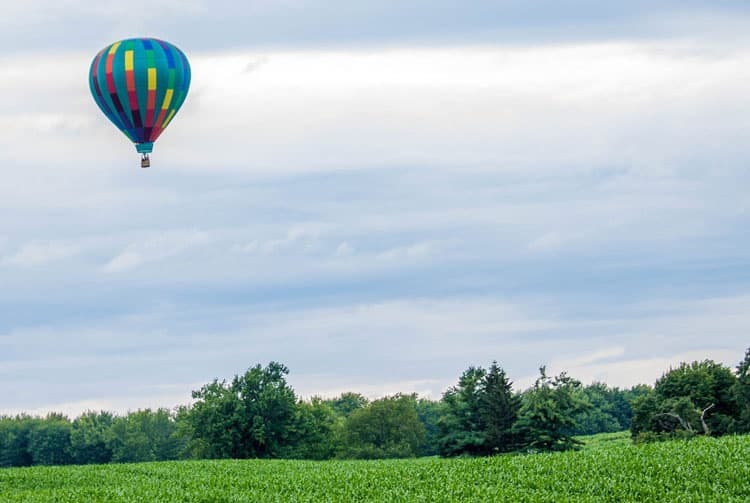 The Balloons over Letchworth tours are one of the best ways to experience this beautiful park. What’s even better, is that Letchworth State Park is situated amongst New York State’s Finger Lakes region. So, beyond a hot air balloon ride, there are countless parks, waterfalls, wineries and more to enjoy. Balloons over Letchworth flies from May through to October, weather permitting. The minimum age for the experience is 12-years-old. There are few things greater than fulfilling a dream. I take great pleasure in crossing an item off my bucket list. Going on a hot air balloon ride had been on my bucket list for quite some time. In particular, I had dreamt of doing so in Cappadocia Turkey. But, until I can make it to Turkey, I decided to incorporate this dream into upcoming travel plans. My husband (boyfriend at the time) was brave enough to say yes to this travel adventure during our trip to Napa Valley. I had been to Napa Valley prior and loved the peace and tranquility of the vineyards and rolling hills. I imagined viewing these from above and it made my heart sing. Our day began at sunrise. We were taken to Domaine Chandon for a continental breakfast, coffee and tea before the flight. When it was announced that our flight would be delayed due to high winds, I worried this travel adventure would end before it even started. However, I understood all precautions should be taken it what we know can be a risky activity. Once the all clear was given, we watched the balloons get inflated. It was a beautiful sight! After climbing into the basket it was up, up and away! I couldn’t believe how smooth the take off and landings were. The views of Napa Valley from above were breathtaking! I also enjoyed watching the other hot air balloons race back and forth. At the end of ride we were taken back to Domaine Chandon for a full breakfast on their patio. We toasted our success with their champagne! 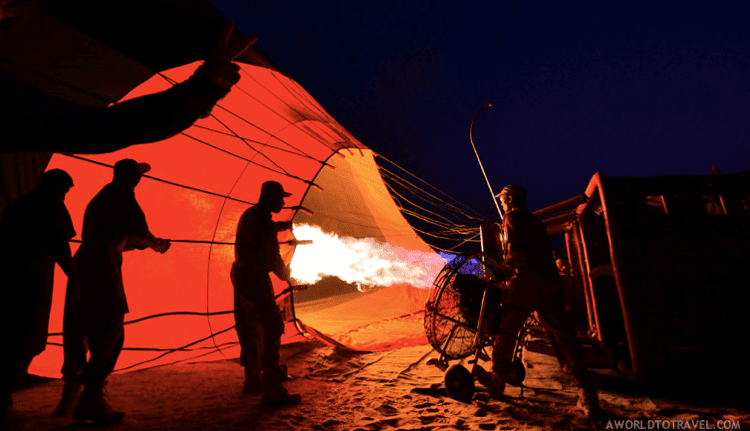 Word of advice-the fire that keeps the hot air balloons afloat is very hot! Men and women were advised to wear hats. Now go out and fly! Not many things will get me up at 4:30 am on a Saturday but the chance to watch the sunrise over the Sonoran Desert is an adventure that is definitely worth getting up early for. The morning started off with Hot Air Expeditions picking me up at my resort in Scottsdale, we arrived to the launch site in the desert outside of Phoenix just as the first orange rays of daybreak appeared. After a quick safety briefing we climbed into the basket and with a few wooshes of the burner we had liftoff, floating quietly as the desert landscape spread out beneath us. Reaching heights of nearly 5000 feet and gently dipping down just feet above the plains of saguaro I can’t imagine a better way to explore the Sonoran Desert. 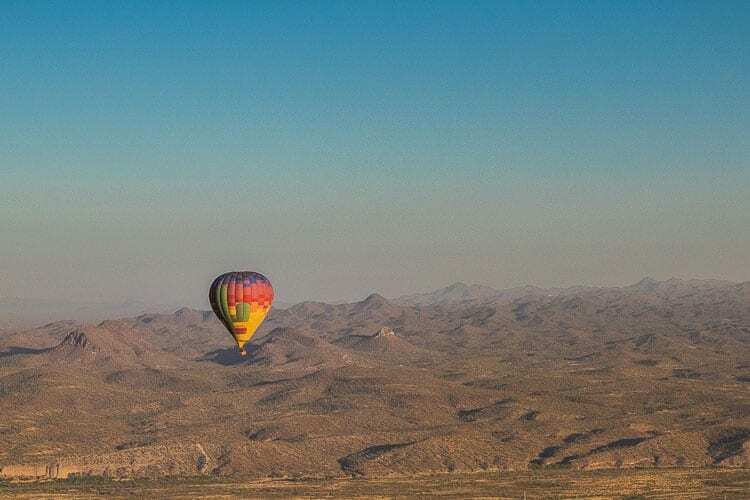 My hot air balloon flight was magical, thrilling and a bit surreal, and was the highlight of my trip to Phoenix. How about you? Have you been on a fantastic balloon somewhere around the world? Share! I’ve never experienced a hot-air balloon ride! Adding this to my bucket list. Have done Bagan and Cappadocia. Would love to do all the others! I also have done one in Catalonia. Great overview. Have done Bagan and Cappadocia. Would love to do the others. Also did a beautiful one in Catalonia. These are beautiful to watch go by when you’re on the ground. I don’t think I’m brave enough to get into one. I haven ever been in a hot air balloon. However, I would totally love to check out any of these places from above! Amazing! I have yet to fly in a hot air balloon, but would definitely consider it, especially while traveling. I imagine it being a wonderful way to explore and see a destination. These are so beautiful. We saw the New England festival of balloons in Vermont that goes on annually (and took aerial photos with Ambit Drone) can’t wait to share our aerial coverage, but we have some from the ground photos on the blog too 🙂 I want to see more hot air balloons and perhaps get in one someday! I have a massive fear of heights, however, I want to go on a balloon ride so bad. The views would just be magnificent. A balloon ride is on my bucket list. I would love to do one in Napa specifically! Nice view I bet, definitely an experience! I love the idea of hot air balloons, but I’m not sure I could actually go for a ride myself. I still think they’re beautiful to look at when they’re up in the sky. Amazing! I’ve personally never been up in a hot air balloon as of yet but after reading these stories and the breath taking photos I’m definitely putting air ballooning on my bucket list. The views are spectacular to say the least. Thank you so much for this inspring post. 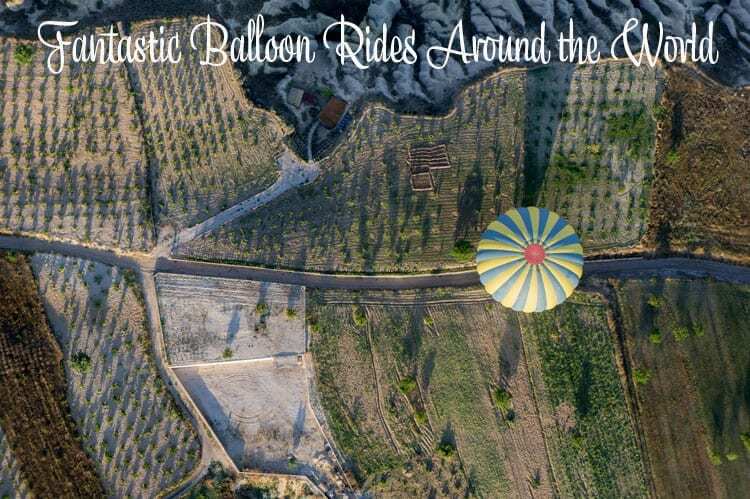 My husband has been up in a hotair balloon with a friend but I have never gone up.It looks like a lot of fun and a good way to see the countryside. Ah, balloons in the sky — they are so beautiful. For years around here, we had a local balloon race, it was always fun to watch. Such beautiful pictures! I have always wanted to do hot air balloon rides but I am so afraid of heights. Even better to do a tour around the world in them. What better way to see so many countries! I am SO adding flying over the Serengeti to my bucket list, along with flying over Cappadocia. I love hot air balloons – it’s like tubing in the air. And the scenery at those spots is just to die for! So many beautiful places to see! It all looks so pretty from way up there! I wonder if I would be brave enough to go on a balloon ride. I’ve always wnated to do this! Cappadocia has been on my list forever but Bagan is now definitely there. Another place that would be really neat would be White Sands NM. The have a balloon festival in late September and I imagine the contrast between the colorful balloons and white sand would be amazing. I won a trip in Virginia, and my husband and I had a marvelous hot air balloon ride over “horse country”! That was THE main reason I wnted to win that contest so badly!! What a great post! I love seeing the landscapes from so many different balloon rides. Jessica Korteman’s absolutely amazed me. I’d love to see that Turkish landscape for myself. I’ve long wanted to take a hot air balloon ride, but since it’s pretty expensive, I don’t want to do it just anywhere. This post has given me some great ideas. I hope I can do this bucket list advanture soon! I even love watching them from the earth – although ballooning over it would be awesome! I am afraid of heights but would muster up the courage to ride in these balloons. I’ve always dreamed of doing a hot air balloon ride! My absolute top pick is to ride in Cappadocia – so iconic and beautiful. But it’s so cool to see all these other locations you can ride over as well. Some I wouldn’t have thought of. And how interesting to see all the different scenery from above! I haven’t been on a hot air balloon yet. If I could choose I’d definitely splurge it in Bagan or Cappadocia! @Tiffany, if you can get to Paris, you can go on a hot air balloon that is tethered to the ground, that may be a good first step, plus well, Paris! I was in Bagan earlier this year, it was absolutely magic! Thanks for the read, Andi! It is my dream to go on a hot air balloon ride! It will be cool to check out the one in Napa while visiting a winery. There is also one near Calgary every year, maybe I should stop by there next year! @Cat, oh I’d love know about the one in Calgary, it is such a beautiful region. You, me, ABQ, next fall. It’s a date? Andi, I loved this post! It’s so wonderful to have a whole collection of hot air balloon rides from around the world in one spot! I’ve never been up in a balloon, but I’d love to try it — anywhere. I think doing it in Africa would be at the very top of my list though. @Ann, I had no idea they did them in Africa, and I’ve decided that’s where I want to do one! I am in love with all these photos! Cappadocia has been on my list for s while and my parents live by Lechtworth State Park. I have to visit all of these! @Jen, you can add your own ride at the Albuquerque festival as a highlight! 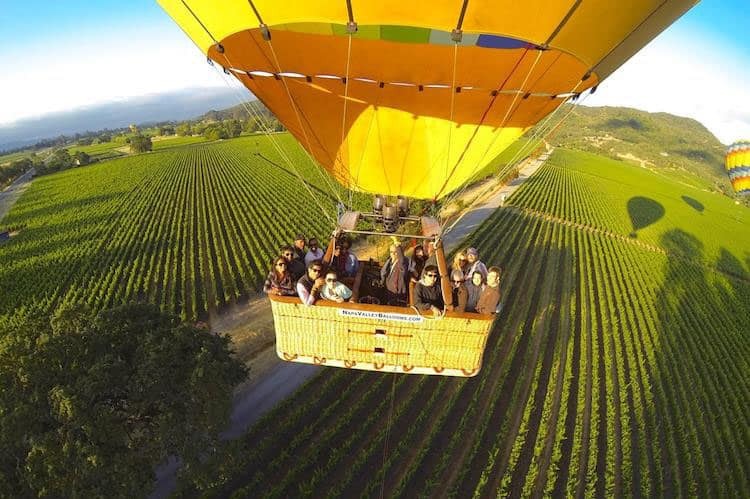 I have never taken a hot air balloon ride but often think about it because Napa is so close. It must be so peaceful. I love these photos, especially the one you chose for the pin. @Jenna, all those years living in the Bay Area and I never really wanted to do one in Napa, seemed to close to home! I’d love to go for balloon ride someday. @MD, I hope you get to! 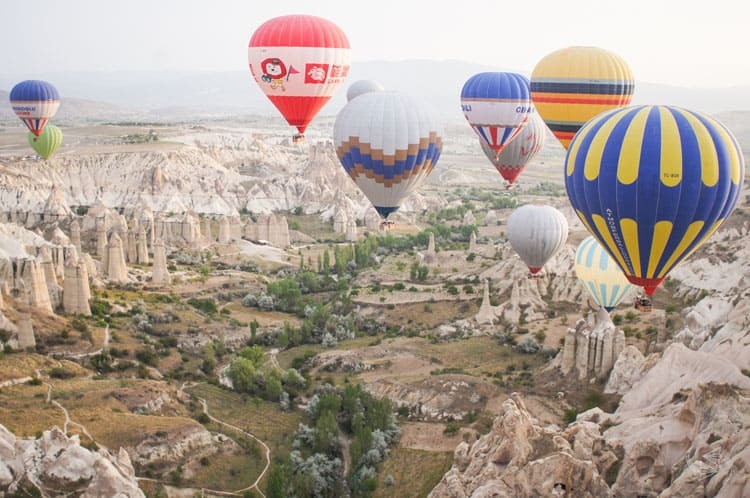 My dream trip is Cappadocia and the balloons, of course! Hope to do it very soon! This looks like so much fun! I have always wanted to take a balloon ride. I bet it’s very scenic and beautiful to be up that high.